Typography can help you impress your boss (or friend)! Image references: left and right. An integral part of design is knowing which typeface is appropriate for the subject matter. For example, serif typefaces are often used for large blocks of text because our brains can recognize the letterforms and make reading easier. Serif typefaces also do not strain the eyes when read in a printed format. Sans serif typefaces are often used for short lines of text and headlines, they are usually bold and meant to attract attention. Serif typefaces have actual “serifs” or strokes that extend past the edges of their letters. They are often called “feet.” This is associated with a more outdated form of writing that showed where a pen started a stroke or trailed off. Serif typefaces are often used in traditional business logos like law firms, high-end fashion brands and banks. 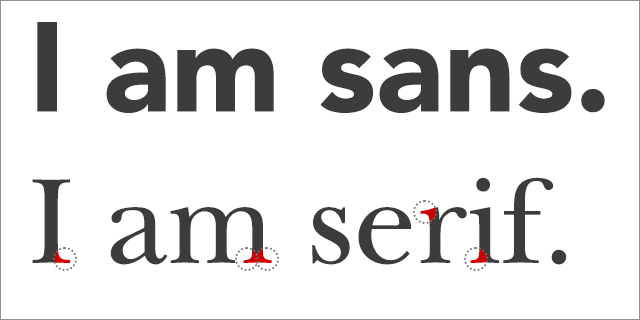 Sans serif typefaces do not have serifs and are often bolder or more elongated than serifs. As you may have noticed, they are much more common in the world of design today. The wide use of sans serif typefaces came about during the advent of the internet. They are typically easier to read on the web. Limit the number of fonts you use for a flyer or other designed material. Two or three is ideal or even better use one typeface and use multiple fonts (see what I did there?). Find online inspiration for your projects, try: http://beautifultype.net/, https://fontsinuse.com/, https://typostrate.com/typography-inspirations/. Keep it simple! The more elements that are on the page, the harder it will be for your reader to understand the message. Don’t be afraid of scale – It can make your designs look dynamic and add emphasis where you want it. No comic sans, ever! If you are trying to convey a fun and casual look to Babiole, Nora, and Albus & Friends. → How Can I Use LinkedIn to Grow My Business?